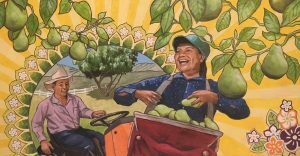 Arts in Education of the Gorge recently received a grant to create a series of murals depicting the diversity of agricultural workers who have contributed to the bounty of the Hood River Valley for generations. 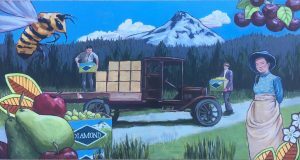 Designed by artist Michelle Yamamoto, the murals will be painted by Diamond Fruit workers, local orchardists, community members and students from Mid Valley, Wyeast and Hood River Valley High School. There will be an accompanying video at the mural site in Odell as well as along the Fruit Loop. Completion is scheduled for fall 2019. Saturday mornings until the second week of October The Dalles Farmers Market features produce from local farms at City Park. There’s also an education booth to help guests learn about the benefits of buying local, seasonal food with curriculum developed by vendors and activities for children. The Market recently received a Burchell grant to implement the SNAP assistance program for low-income families to purchase fresh, local food. Check out the weekly fresh sheet on their website!